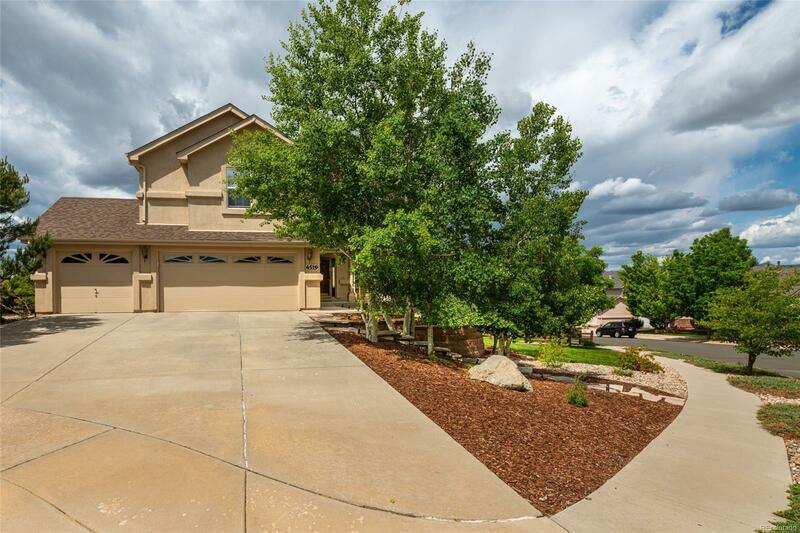 Remarkable 2-story home on .4-acre lot with mature landscaping and views of the mountains, including Pikes Peak. The home is open, bright, and roomy. The entry-way greets you with hardwood floors and grand views of the main level and upper level. Large kitchen adjoins to the great room and showcases views of the mountains. Formal dining room and eat-in kitchen, vaulted ceilings in the great room and the master bedroom are just a few of the fabulous features. There are fireplaces on the main level and in the basement. Master bedroom is large and spacious with large walk-in closet and 5-piece bath. Basement is finished to include walk-out, wet-bar and plenty of space for relaxing on the weekends or entertaining your guests. The large lot allows for plenty of space for all on those warm spring and summer days and allows for plenty of privacy.